Maybe you’re about to go on a trip or have a sudden flash of insight that makes it urgent to make or update your will. In certain states, including Hawai`i, holographic (or handwritten) wills are accepted, but you should know a few things before breaking out the pen and stationery. WHAT MAKES A HOLOGRAPHIC WILL VALID? First of all, unless you're an experienced estate planning attorney in the state you live in, handwriting your own will may lead to more problems than it's worth. In addition to lacking state-specific legal knowledge, handwritten wills are more likely to be taken to court by beneficiaries. To be valid in the State of Hawai`i, first, the substantive parts of the will need to be in your handwriting, and, second, it needs to be signed by you. 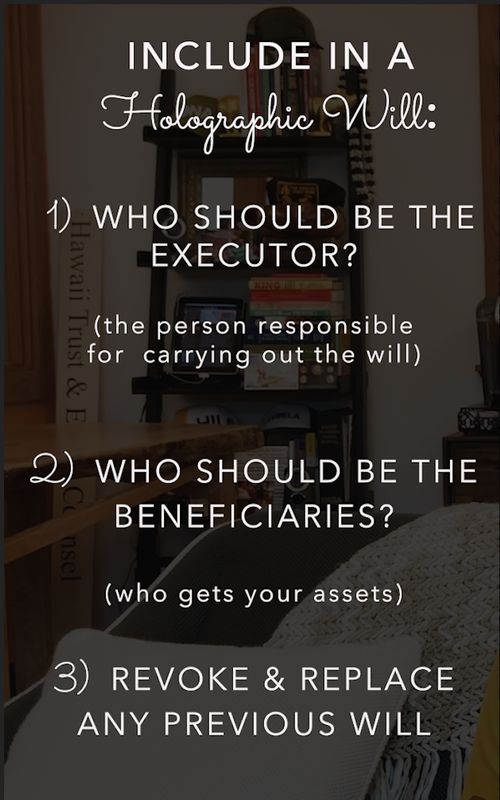 In addition to being primarily handwritten and signed by the executor (person who's will it is), a will should also include three other crucial parts. First, the executor of the estate should be named. The executor is the person who will be responsible for carrying out your wishes defined in the will. Generally, what happens after someone passes away, is that their executor is appointed (according to their estate plan), then takes an inventory of the estate, pays debts and taxes, and finally makes sure the beneficiaries get what they are stated to receive. Along with appointing the executor, a will should appoint a beneficiary or multiple beneficiaries. Beneficiaries are individuals or entities (sometimes nonprofit organizations) to whom the person who passed away (known as a decedent) bequeaths real and personal property, cash or other assets. The will states and defines the decedent's beneficiaries and the inheritance they are to receive. The last major piece of information to include in a will is to state that it revokes and replaces any previously written will. It could get very confusing and contentious for those you leave behind if there are different versions of your will floating around. We generally recommend destroying any outdated estate planning documents that have been revoked and replaced by current documents. Newer PostWhat if I die without a will? Older PostWhat is a signatory?